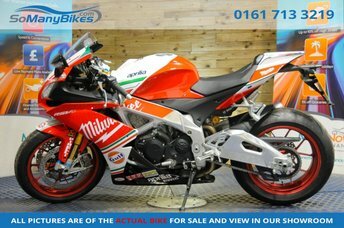 2016 (66) Aprilia RSV1000 Aprilia RSV4 RF - Grab yourself a bargain! Unwanted competition prize, get yourself a Nearly new bikes at a fraction of the price! Benefits from proffessional Milwaukee paint scheme - Lightweight forged aluminium wheels, Fully adjustable Ohlins forks, shock and steering damper. Brembo radial monoblocs, a polished aluminium frame. The RSV4 RF has a more refined racing ABS system, traction, launch and wheelie control, a quickshifter and three riding modes (Sport, Track, Race). New electronics control engine-braking parameters, depending on the gear position, Auto-blipper. Comes with Owners Manual and Service book Here at SoManyBikes we are committed to bringing our customers the best finance deals. Thats why we offer low rate finance with a low deposit, with an extended warranty and even poor credit finance! We carry a huge range of stock with competitive prices, full parts and labour warranty packages (that actually work!) and hassle-free, friendly service. Have your new bike delivered by our professional and affordable transport service - www.moveamotorbike.com. Visit www.somanybikes.com or call our friendly staff on 0161 713 3219 for help and advice on your next bike! 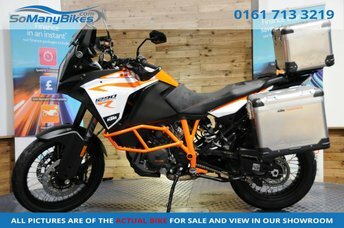 2018 (18) KTM Super Adventure R 1290 - The KTM 1290 comes with, Full Luggage, Four rider modes, Cornering ABS and Lean senstive traction control, all controlled by the new colour dash - LED cornering headlight, Keyless ignition, Cruise control, Illuminated switchgear, self-locking manual screen and a waterproof phone storage compartment complete with USB input. Here at SoManyBikes we are committed to bringing our customers the best finance deals. Thats why we offer low rate finance with a low deposit, with an extended warranty and even poor credit finance! We carry a huge range of stock with competitive prices, full parts and labour warranty packages (that actually work!) and hassle-free, friendly service. Have your new bike delivered by our professional and affordable transport service - www.moveamotorbike.com. Visit www.somanybikes.com or call our friendly staff on 0161 713 3219 for help and advice on your next bike! 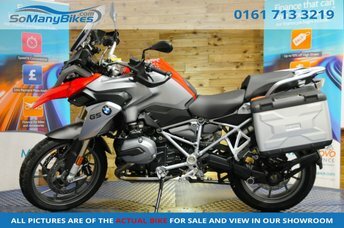 2016 (66) BMW R1200GS - Comes with owners Manual - Gearshift assist pro, BMW Panniers, ABS, ESA, ASC, DTC, Cruise control , TPC, Heated grips , elec screen, - Here at SoManyBikes we are committed to bringing our customers the best finance deals. Thats why we offer low rate finance with a low deposit, with an extended warranty and even poor credit finance! We carry a huge range of stock with competitive prices, full parts and labour warranty packages (that actually work!) and hassle-free, friendly service. Have your new bike delivered by our professional and affordable transport service - www.moveamotorbike.com. Visit www.somanybikes.com or call our friendly staff on 0161 713 3219 for help and advice on your next bike! 2017 (17) MV Agusta F3 800 - Abbo levers, GPR steering damper, Rear sets, Upgraded Air filter, R and G crash protectors, Tank protectors, R and G radiator cover, R and G tail tidy. Electronic rider aid package, Quickshifter - Four riding modes (Sport, Normal, Rain and Custom), Eight stage traction control. Here at SoManyBikes we are committed to bringing our customers the best finance deals. Thats why we offer low rate finance with a low deposit, with an extended warranty and even poor credit finance! We carry a huge range of stock with competitive prices, full parts and labour warranty packages (that actually work!) and hassle-free, friendly service. Have your new bike delivered by our professional and affordable transport service - www.moveamotorbike.com. Visit www.somanybikes.com or call our friendly staff on 0161 713 3219 for help and advice on your next bike! 2016 66 VICTORY JACKPOT JACKPOT 1731 - Low miles! 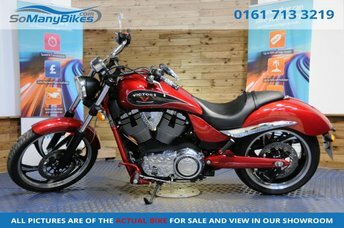 2016 (66) Victory Jackpot 1800 - Stunning machine, great example - Here at SoManyBikes we are committed to bringing our customers the best finance deals. Thats why we offer low rate finance with a low deposit, with an extended warranty and even poor credit finance! We carry a huge range of stock with competitive prices, full parts and labour warranty packages (that actually work!) and hassle-free, friendly service. Have your new bike delivered by our professional and affordable transport service - www.moveamotorbike.com. Visit www.somanybikes.com or call our friendly staff on 0161 713 3219 for help and advice on your next bike! 2016 (16) BMW S1000RR - Full Service history - Brembo brakes, ABS, ESA, ASC, DTC, Cruise control , TPC, Heated grips, Riding modes, Quick shifter, Auto Blipper. Here at SoManyBikes we are committed to bringing our customers the best finance deals. Thats why we offer low rate finance with a low deposit, with an extended warranty and even poor credit finance! We carry a huge range of stock with competitive prices, full parts and labour warranty packages (that actually work!) and hassle-free, friendly service. Have your new bike delivered by our professional and affordable transport service - www.moveamotorbike.com. Visit www.somanybikes.com or call our friendly staff on 0161 713 3219 for help and advice on your next bike! 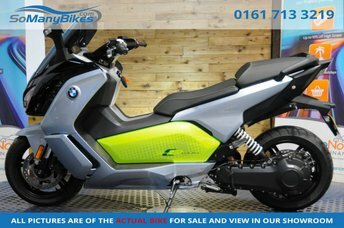 2018 (18) BMW C Evolution - Stunning colour LCD display - The regenerative braking system, 'Dynamic Mode' - 'Road' and 'Eco Pro' settings, 'Sail' mode, which removes all regenerative return, allowing you to coast down hills. Here at SoManyBikes we are committed to bringing our customers the best finance deals. Thats why we offer low rate finance with a low deposit, with an extended warranty and even poor credit finance! We carry a huge range of stock with competitive prices, full parts and labour warranty packages (that actually work!) and hassle-free, friendly service. Have your new bike delivered by our professional and affordable transport service - www.moveamotorbike.com. Visit www.somanybikes.com or call our friendly staff on 0161 713 3219 for help and advice on your next bike! 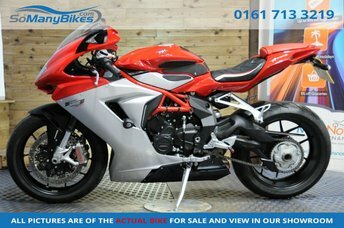 2017 17 DUCATI 959 PANIGALE 959 PANIGALE - Stunning machine! 2017 (17) Ducati Panigale 959 - Traction control, Racing ABS, Riding modes, Quickshifter, a multi-function dash, Brembos, and fully-adjustable suspension. Comes with Owners Manual and Service book - Here at SoManyBikes we are committed to bringing our customers the best finance deals. Thats why we offer low rate finance with a low deposit, with an extended warranty and even poor credit finance! We carry a huge range of stock with competitive prices, full parts and labour warranty packages (that actually work!) and hassle-free, friendly service. Have your new bike delivered by our professional and affordable transport service - www.moveamotorbike.com. Visit www.somanybikes.com or call our friendly staff on 0161 713 3219 for help and advice on your next bike! 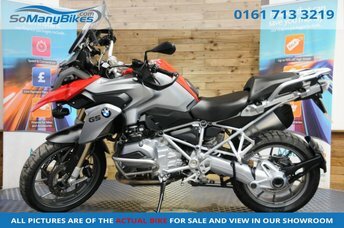 2015 (15) BMW R1200GS TE - Full BMW history - Rare low suspension - Dynamic ESA - ABS - Engine bars - Bash plate - Cruise control - Heated Grips - Here at SoManyBikes we are committed to bringing our customers the best finance deals. Thats why we offer low rate finance with a low deposit, with an extended warranty and even poor credit finance! We carry a huge range of stock with competitive prices, full parts and labour warranty packages (that actually work!) and hassle-free, friendly service. Have your new bike delivered by our professional and affordable transport service - www.moveamotorbike.com. Visit www.somanybikes.com or call our friendly staff on 0161 713 3219 for help and advice on your next bike! 2014 (14) BMW R1200GS - Full BMW history - Dynamic ESA - Crash bars - Spotlights, ABS, ESA, DTC, Cruise control, TPC, Hand guards, Heated grips, Here at SoManyBikes we are committed to bringing our customers the best finance deals. Thats why we offer low rate finance with a low deposit, with an extended warranty and even poor credit finance! We carry a huge range of stock with competitive prices, full parts and labour warranty packages (that actually work!) and hassle-free, friendly service. Have your new bike delivered by our professional and affordable transport service - www.moveamotorbike.com. Visit www.somanybikes.com or call our friendly staff on 0161 713 3219 for help and advice on your next bike! 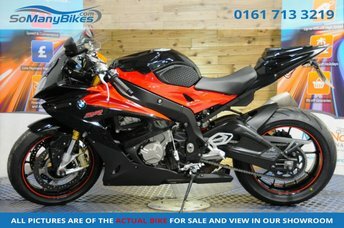 Get the best deal on a used motorbike for sale in Royton, Oldham by making your way to CarBay Limited today. You will find every available model listed here on the website, and as all our stock is competitively priced you should have no problem sourcing a pre-owned to suit your budget. Take the opportunity to browse our current range online before contacting a member of the showroom team to find out more. Our friendly and knowledgeable staff will be more than happy to answer any questions and provide advice and guidance when necessary. Alternatively, why not pay a visit to our showroom in person and take a closer look at the selection of used motorbike models for sale.